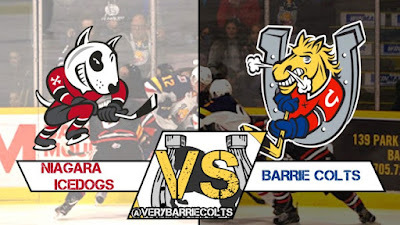 Video highlights from Barrie Colts 6-2 loss to Niagara IceDogs.. #OHL - Very Barrie Colts | A website covering the Barrie Colts of the OHL. Tough night for the Barrie Colts losing 6-2 to the Niagara IceDogs. Barrie only generated 10 shots through the first 40 minutes but looked better in the 3rd period scoring a couple of goals. Kai Edmonds relieved Maksim Zhukov and didn't allow a goal on 16 shots faced. Jacob Tortora scored his 2nd goal in his second appearance with the Ponies, while Tyler Tucker and Justin Murray earned a pair of assists each. Maksim Zhukov 18 saves on 24 shots. (r) Kai Edmonds 17 saves on 17 shots. The Colts next game is Saturday VS the Guelph Storm at Barrie Molson Centre. The team will wear their new 3rd jerseys. If you haven't seen them, click here to take a look. Be sure to grab tickets for the game and support the team! Get tickets here.